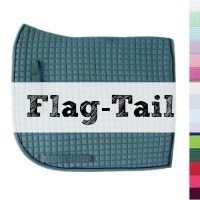 Colorful dressage saddle pads are in high demand. Perhaps its because dressage riders are so limited to colorful attire when it comes time to shine in the show ring. Or perhaps its because dressage riders know that a pretty color can accentuate their horse's gorgeous features and movement. A couture look popping up in dressage in a mono-chromatic color scheme to show off a horse's beautiful coat color. 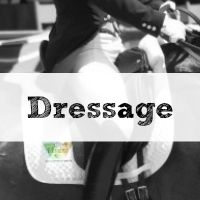 For example, if you have a Chestnut, Buckskin, Palomino or Bay colored horse, try a brown saddle pad, mustard, sunflower yellow pad or a cream dressage saddle pad. Pink dressage saddle pads are also popular for various breast cancer equestrian-fundraising events across our country. 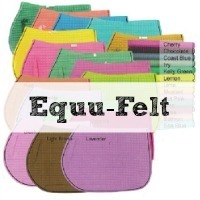 Bon-Vivant carries a minimum of three shades of pink dressage pads: hot pink, candy pink and baby pink. 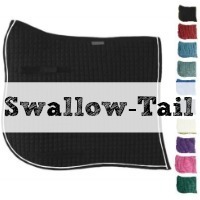 For the larger horses, we often find that jumpers and cross-country riders seek dressage cut pads for their jumping saddles because the dressage cut offers a longer length which works great on wide-backed horses. 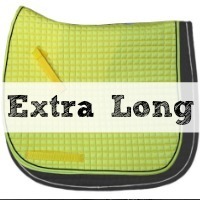 We also carry extra long dressage pads and high withered dressage cut pads for those hard to find options for our long legged riders and high-withered horses.